So, you want to start selling online. A wise decision – ecommerce is booming, and will account for a staggering 95% of all retail purchases by 2040. But before you go cutting yourself a slice of that pie, you’ll need the right tools in place to start selling. You’ve already built a website – but that’s only half the battle. To start taking credit and debit card payments online, you’ll require a merchant account. And not just any old merchant account, either – you’ll need one built for the rigorous demands of ecommerce, from a provider that empowers you to accept payments in a variety of currencies, and with a range of card types. And of course, you’ll also want low fees, and quality customer support. But how do you find the right supplier? Don’t worry – we’ve done the hard work for you. Read on for our breakdown of the top merchant account providers for ecommerce. And if you’re ready to start comparing quotes, get a head-start with our quick, simple (and free!) quote-finding form. We compared the vast range of ecommerce merchant account providers for UK businesses. As it turns out, the best UK ecommerce merchant accounts come from Worldpay, First Data, 2Checkout, PayPal, and Shopify. Worldpay offers an ecommerce merchant account that’s as straightforward as it is flexible. And its range of online payment services is a hit with businesses of all sizes – 300,000 of them in the UK alone, in fact. Worldpay also brings specific expertise in the travel, retail, and video game industries (and more) – so it understands the challenges faced by growings SMEs. Combine all this with simple pricing plans and 116 compatible currencies, and you’ve got a formula for ecommerce success. With half a century of experience and a massive global reach, US-based First Data provides a scalable, reliable merchant account for ambitious ecommerce businesses. It offers low rates, and is ideal if you’re just starting out on your ecommerce odyssey. And even if you’re already set up with another merchant account provider, First Data makes it easy to make the switch. And why wouldn’t you? Its security and fraud management tools are some of the best you’ll find, and its industry-leading ecommerce solutions will take the friction out of your customers’ shopping experience. First Data, like many merchant account providers, isn’t super transparent about pricing on its website. And by their very nature, merchant account fees tend to differ based on the size and sales volume of your business. Hence, the pricing here is more of a guide than anything. However, getting quotes that are tailored to your business – from First Data, Worldpay, or another Expert Market-approved supplier – is something we can help with. Just click here to fill in our short webform and start comparing. US-based 2Checkout provides scalable ecommerce merchant accounts in 180 countries around the world. With several striking payment forms, its ecommerce gateway works with your website to give your customers a better buying experience. Setup is quick and easy, and you can start taking payments within 24 hours. And though they’re across the pond, don’t fret – 2Checkout’s customer service team is available around the clock to answer your questions. Though not a traditional merchant account provider, PayPal is still globally respected as an easy, secure way to accept card payments online. Its sliding price scale makes PayPal’s fees cheaper the more transactions you take, which means big benefits for bigger businesses. It’s also a great option if you already have a PayPal account set up, as you’ll receive instant payouts. It’s got 24/7 customer support, and comes with the knowledge and experience of a true payment industry goliath. Built for those who love to build, Shopify is perfect if you’re a hands-on type, and if you’re looking to add some pizzazz to your ecommerce website. Shopify lets you build a stunning website – then start selling through it. Shopify integrates with over 100 payment gateways, and comes with drag-and drop functionality – so it’s easier than ever to sell in style. Plus, you’ll get access to all the data about your customers, takings, and orders from your mobile – all displayed in a simple, good-looking dashboard. Shopi-fine! If you’re ready to open up an ecommerce merchant account and start selling online… you’re in luck! Our handy form lets you start comparing quotes from Expert Market’s approved suppliers. Just enter a couple of details about your business and industry, and we’ll match you with the best merchant account provider for you. 1. What is an ecommerce merchant account? Ecommerce businesses require merchant accounts to accept debit or credit card payments. You can get a merchant account from a major bank or by online payment processors, and you do not have to choose the bank you use for business banking to provide your merchant account. 2. Is a merchant account the same as a business bank account? Nope – they’re two separate accounts. Your merchant account is what lets you accept card payments online (or face-to-face, if you’re planning on opening up a bricks and mortar store). It’s like a holding pen, where these payments dwell for a bit before being released into the green pastures of your business bank account. 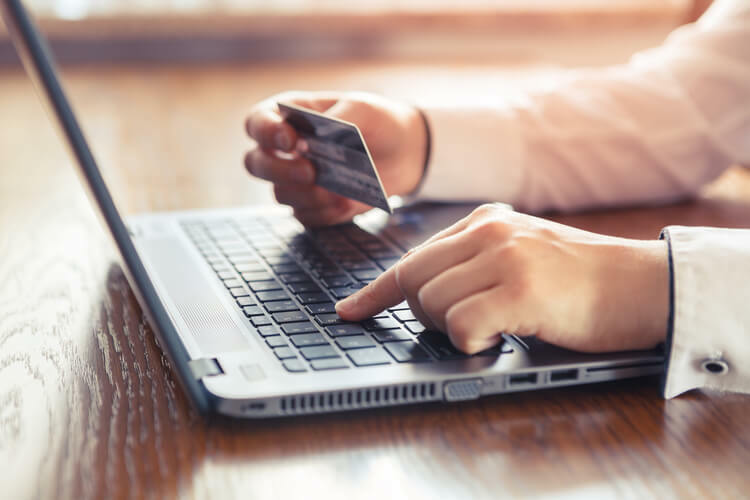 Your business bank account is where the funds you take online (or at the till) go when they’ve been validated – and, of course, after your ecommerce merchant account provider has taken its cut. 3. What is a payment gateway? A payment gateway (also known as an ecommerce gateway) is the software that works with your website to process, validate, and secure online transactions. It usually comes with your ecommerce merchant account. A payment gateway can be hosted on the website of your payment provider to ensure PCI compliance. Alternatively, it can be integrated into your own website, to make for a smoother customer experience. A payment gateway is a crucial part of the infrastructure of online payments – so crucial, in fact, that you can’t start selling without one. 4. How much does an ecommerce merchant account cost? Ecommerce merchant account fees differ by the supplier. Generally, though, you’ll pay a transaction fee – usually a percentage of the value of each sale. Some merchant accounts also come with a monthly cost, and occasionally a setup fee – so make sure you read the small print before signing on the dotted line. To get a better idea of how much you can expect to pay for an ecommerce merchant account, take a minute to fill out our free quote-finding form and compare quotes today.